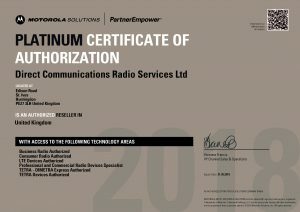 Established in 1987, DCRS is one of the UK’s TOP 4 Motorola Solutions MOTOTRBO two-way radio communication products and software application Platinum Elite Specialist partners supporting clients throughout the UK and Europe offering products on hire, sales, lease and consultancy / after sales support & maintenance basis. With technical excellence, and accreditations for quality assurance, health and safety and product support DCRS can offer exceptional client service by combining our technical and operational expertise, resources and commitment throughout your product and systems lifetime.In recognition of this we have been awarded the Queen’s Royal Warrant. Our project managers, engineers and support staff are trained to the highest standard, taking initial ideas through to bespoke design, project management, commissioning and installation followed by a complete maintenance and service aftercare package. The dedication to our client’s needs and commitment to delivering pioneering technology continues to enhance our reputation within our sector and is further strengthened by the product manufacturers we support; Motorola, Hytera and Vertex who are all known for their outstanding reliability, quality and expertise within our field. Utilising our vast experience within the two-way radio communications industry our dynamic product range provides the best solutions for you and your business. We have applied these to markets such as: construction, education, healthcare, manufacturing, logistics and distribution, retail and hospitality, oil and gas, utilities and renewables, transportation and public safety and government. Providing you with an affordable and accessible solution, all of your equipment will come from a professional and well-organised company, which still believes in “quality and value found in a personalised service”. To experience how MOTOTRBO and DCRS really do go that extra mile; contact us here today, chat live or call 0800 043 2688 to discuss any requirements you may have. DCRS are pleased to have been continually awarded and certified to ISO standards since 1998. DCRS has proved its excellence in business after passing a rigorous independent assessment and accreditation process. DCRS is pre-qualified under RISQS, the Rail Industry sectors pre-qualification service. It enables the buying organisation to use Achilles’ Proven supplier pre-qualification system to manage risk with the supply chain and comply to EU regulations. DCRS Ltd are now fully registered with ARIBA Sourcing. DCRS has been awarded accreditation from Safecontractor for its commitment to achieving excellence in health and safety. Constructionline is a register for pre-qualified contractors and consultants used by the construction industry of the United Kingdom. The database is accessed by over 2000 organisations. 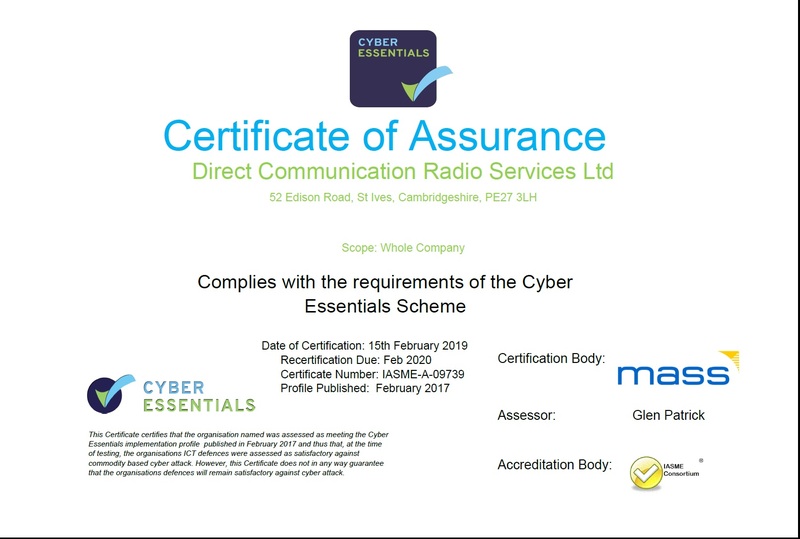 Cyber Essentials aims to help organisations implement basic levels of protection against cyber-attack, demonstrating to our customers that we take cyber security seriously. DCRS are proud to be members for the FCS who represents the vital business-to-business market for voice and data communications. The dealers, manufacturers, re-sellers and support industries which enable companies to do business with one another in today’s global, digital marketplaces.